Choke the band around a post. The band should be at the same height as your elbow. Stand with your right side to the band a couple of feet away. Grasp the end of the band with your right hand, and keep your elbow pressed firmly to your side. 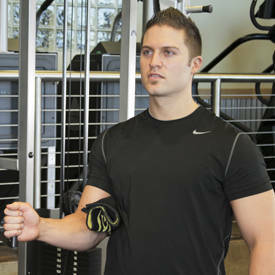 We recommend you hold a pad or foam roll in place with your elbow to keep it firmly in position. 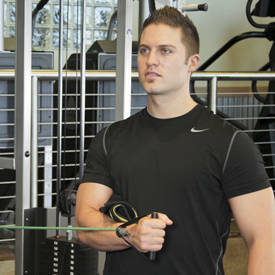 With your upper arm in position, your elbow should be flexed to 90 degrees with your hand reaching away from your torso. This will be your starting position. Execute the movement by rotating your arm in a forehand motion, keeping your elbow in place. Continue as far as you are able, pause, and then return to the starting position.